Heat oven to 375°F. Spray 8 or 9-inch square pan with cooking spray. Remove dough from can. Unroll dough; separate into strips. Cut each strip in half crosswise to make 20 pieces. Press each piece to form 2 1/2-inch square. Top each square with 1 slice of pepperoni and 1 cheese cube. Wrap dough around filling to completely cover; firmly press edges to seal. Place spread mixture from breadstick package in small microwavable bowl. Microwave on High 10 to 20 seconds or until melted. 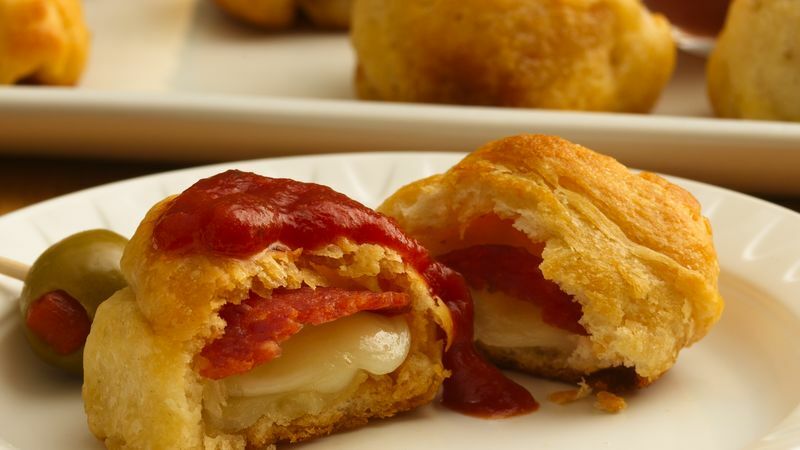 Dip each filled dough snack in melted spread mixture. Place seam side down with sides touching in pan. Drizzle with any remaining spread mixture. Bake 15 to 22 minutes or until golden brown. Cool 3 minutes; remove from pan. Serve warm snacks with warm pizza sauce.